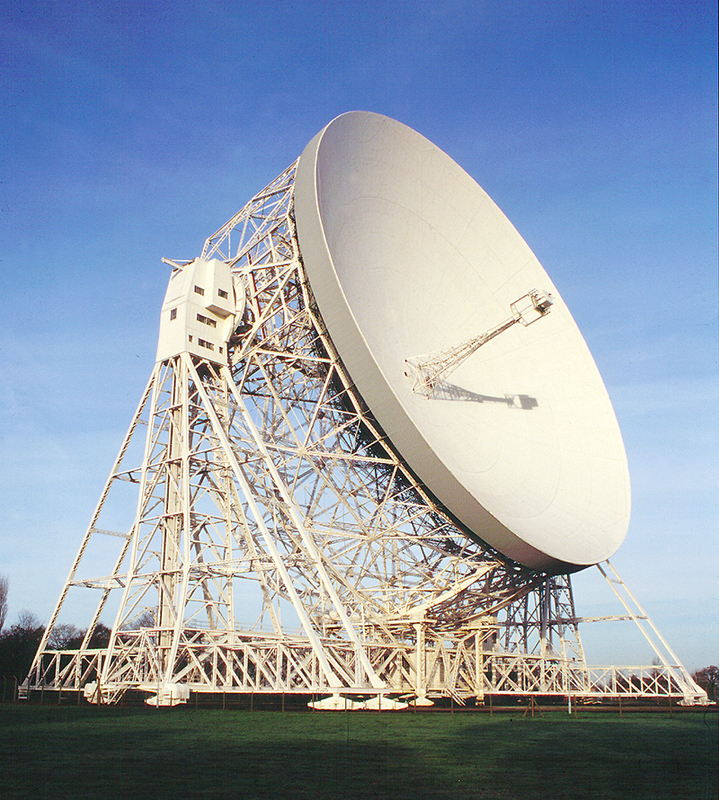 Observations are made here using the Lovell and MKII telescopes at Jodrell Bank and the 32m telescope at Cambridge as part of the European VLBI network. 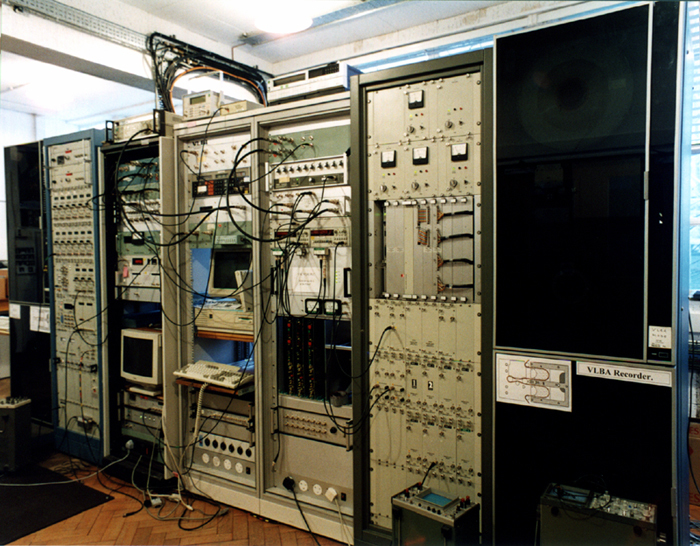 The two VLBI formatter and tape recording systems. The European VLBI (Very Long Baseline Interferometry) Network or EVN is used by radio astronomers to obtain very detailed images of radio sources. It comprises telescopes situated across Europe to synthesise a giant telescope over 2000 km across. Chief amongst these are the Westerbork array in Holland, the 100m telescope at Effelsberg in Germany, two 32m telescopes at Bologna and Noto in Italy and the 25m telescope at Onsala in Sweden. 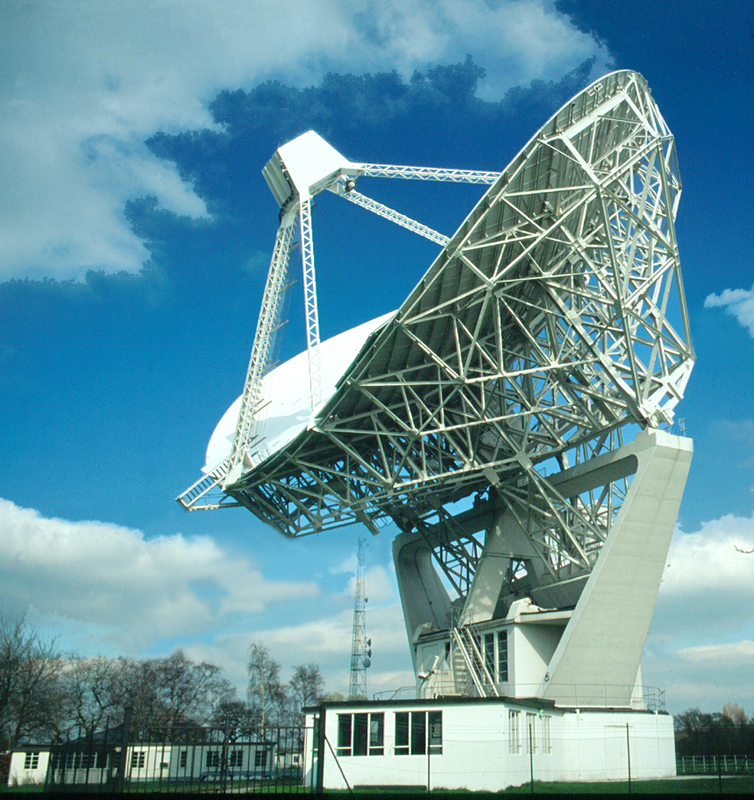 The National Facility here provides two telescopes for the array, either the Lovell or MK11 telescope at Jodrell Bank, dependant on the observing frequency in use, and the 32m telescope at Cambridge. At present there is no way of bringing the signals together to be correlated in real time as is done for MERLIN, so the signals have to be recorded at each site onto tapes capable of storing up to 1 Gbit/second. 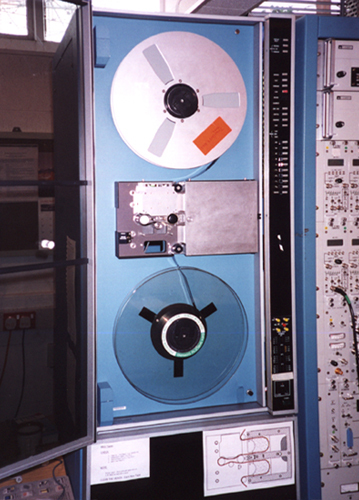 The equipment in the racks shown in the picture above is thus used to sample and format the data which is then written onto 1" wide tape in very high speed recorders. 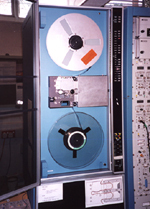 At the end of each observing session the tapes are transported to a central correlator site where they are replayed in parallel and the signals from each telescope correlated with all the others as is done in the MERLIN system. The data must be played in exact synchronism so the time as measured by each observatories' atomic clock is attached to each block of data. The time standard provided by the satellites of the Global Positioning Network is used the synchronise all the atomic clocks involved. One of the 1" tape decks. At present the tapes are correlated at the Max Planck Institute for Radio Astronomy in Bonn, Germany, but a new correlator is being built at Dwingeloo in Holland for the Joint Institute for VLBI in Europe, JIVE. 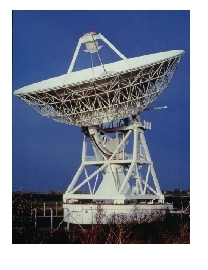 The EVN telescopes conduct simultaneous observations for up to 17 weeks a year and regularly combine with the telescopes of the MERLIN array. The network is also sometimes linked to a similar VLBI network in the US, called the VLBA, to create a "global" network. The maximum separation, and hence resolution, obtained with VLBI networks has been limited by the size of the Earth, but the Japanese have successfully deployed an 8m radio telescope, called HALCA, in space and this will allow the resolution of observations made in conjunction with ground-based telescopes to be tripled! The 76m Lovell Radio Telescope. 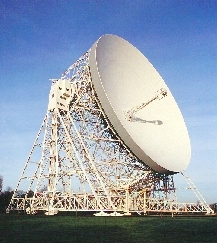 The MKII Radio Telescope at Jodrell Bank. The 32m Radio Telescope at Cambridge.